This sport is hugely popular in the UK with almost any type of dog being suitable so long as the dog is relatively fit, healthy and agile, therefore it suits the German Shorthaired Pointer very well. As a handler you have to be fairly fit as well as you have to keep up with your dog. The animal must be at least 12 months old and physically mature before any serious training can begin. The UK Kennel Club regulations state that a dog may not be entered in competition before it is 18 months of age. Dogs of any size can successfully take part in agility, from Yorkshire Terriers to Great Danes with the height of the obstacles set in relation to the dog’s size. Any dog over 17 inches at the withers (shoulders) would jump a maximum height of 2ft 6ins .This height is nothing for your normal German Shorthaired Pointer; in fact they would sail over it. To begin agility your dog needs to have some basic obedience skills such as “sit”, “wait” and a recall. The more advanced directional signals can be learnt as the dog progresses. Your dog will eventually be working off the lead, therefore it is necessary for your dog to be OK with other dogs, although dogs run singly in competition so as long as you can control your dog this is not so vital unless you are going to compete with dogs as a team. There are a wide range of obstacles which your dog has to learn; some easy some not so easy. 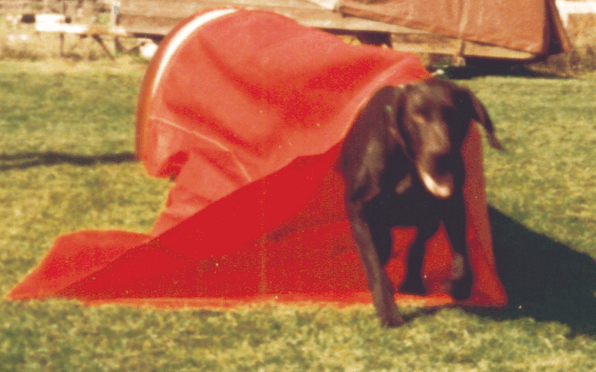 There are tunnels, both the open type and ones the dog has to push open as it goes through. 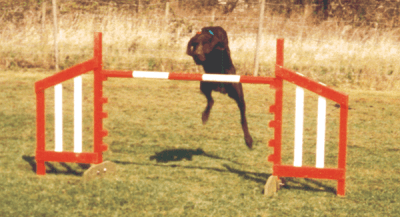 Jumps aren’t difficult except there is only a rail on the top of the jump so you must teach your dog not to go underneath. There are also obstacles that have contact points which your dog must touch. The “A” frame, Dog Walk and Seesaw are such obstacles therefore training with a reputable club is very important to teach both you and your dog to negotiate each obstacle correctly and safely whilst still maintaining fun and enjoyment for both handler and dog. Agility is a competitive sport with courses run against the clock, although accuracy is just as important as speed! However you do not have to compete to enjoy agility indeed many people young and old take their dogs along to agility just to have fun. It is also a great way to keep both your dog and yourself fit. So if you fancy giving agility a go, contact your local dog training club or The Kennel Club to find your nearest club, who should be happy to help you and provide you with more information. Go on treat yourself and your dog to some fun.